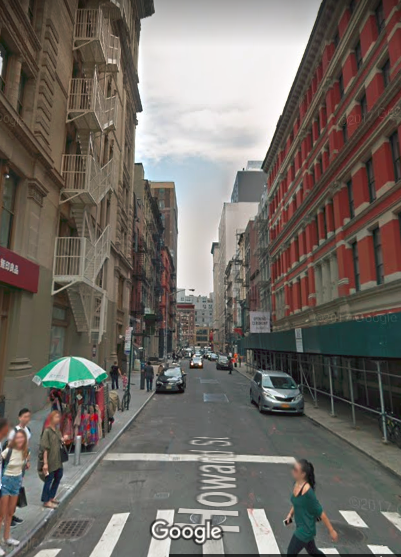 A man and a woman walking on Howard Street in New York City suffered critical injury after being hit on their heads by a falling piece of fire escape on Friday afternoon. The man, identified as 58 year old Richard Marchhart from Long Island, succumbed to his injuries a day after his hospitalization. He left behind a wife and three children: a daughter going to high school and two sons going to college. The injured woman is a 24 year old artist who was on her way to a studio at the New York Academy of Art on Franklin Street. The piece that fell from the seventh floor was a 150 pound step from the fire escape. The step gave way as a building inspector stood on it during a routine inspection required by the DOB. The inspector who was hired by a private contractor started to fall but thankfully she was able to pull herself up. After the accident, the NYC Department of Buildings issued a violation for failure to safeguard the building. Later on scaffolds were erected on the sidewalk and a crew of inspectors were seen jumping on every step to see if they were holding. The New York Personal Injury Lawyers at Gair, Gair, Conason, Rubinowitz, Bloom, Hershenhorn, Steigman & Mackauf have vast experience with these types of premises liability cases. Among similar cases we have handled is one in which one of our clients was standing on a fire escape landing. The landing collapsed causing him to fall approximately 30 feet to the ground. He was severely injured as a result. The case settled for $5 million immediately prior to trial (see previous blog). In another case our attorneys successfully represented a man whose skull was split in two by a security fence that fell from a building. He miraculously survived. The case was settled for multi-million dollars. The amount is confidential.